Born in Horten, Norway on December 20, 1899, he studied at the Horten Technical College. He moved to the United States and was employed by the Westinghouse Electric Company, becoming an American citizen in 1929. He joined the United States Navy and was closely associated with Polar Exploration. He was a member of Rear Admiral Richard Byrd's second Antarctic Expedition (1933-35), was Chief of Staff on Byrd's Third Expedition (1939-40) and received Congressional Medals for each of these expeditions. In addition, the Ronne Ice Shell in Antarctica is named for him. Following duty with the Navy in World War II, he led a private expedition to the South Pole (1947-48). On his return he announced that he had proved that Antarctica was a single continent and not two islands. He died at Bethesda, Maryland, on January 12, 1980 and was buried in Section 2 of Arlington National Cemetery. 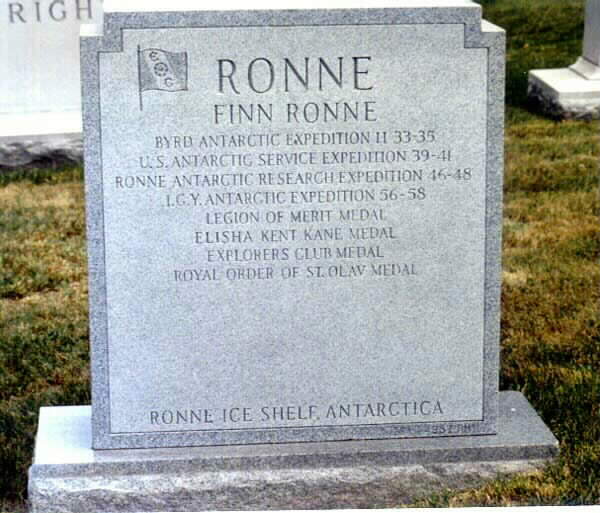 Finn Ronne was a Norwegian-American Explorer of the Polar Regions, particularly the Antarctic. Ronne went to the Antarctic nine times and his work greatly contributed to the mapping of the area and the exploration of the Ronne Ice Shelf on his private Ronne Antarctic Research Expedition (1946–48). 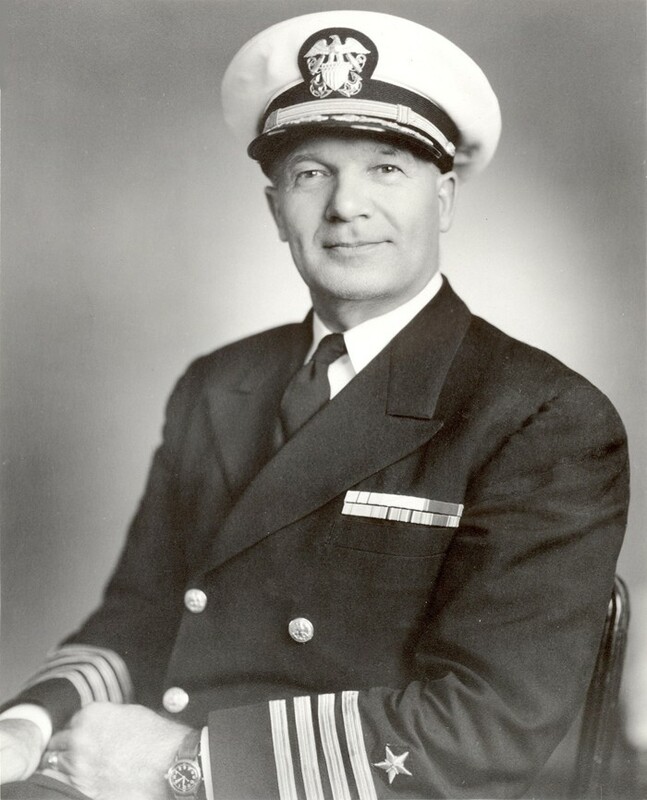 After serving several years in the U.S. Navy during World War II, where he rose to the rank of Captain, he returned to Antarctica after the War with the financial support of the American Geographical Society as well as government supplies and a ship. In February 1947, Ronne sailed for the Antarctic from Beaumont, Texas, beginning his own Ronne Antarctic Research Expedition and from 1947-48 mapped and explored the Weddell Sea coastline. EDITH MASLIN RONNE "Jackie" (Age 89) On June 14, 2009, in Bethesda, Maryland. Jackie was the first American woman to set foot on the Antarctic continent as a pioneering woman and working member of the Ronne Antarctic Research Expedition, 1946-48. Ronne Ice Shelf in Antarctica is named for her. 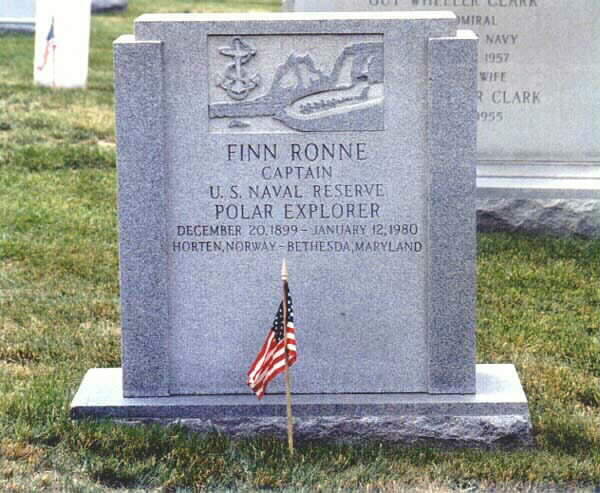 She was the beloved wife of the late Norwegian-American polar explorer, Captain Finn Ronne, who died in 1980. She was past president of the Society of Woman Geographers and a fellow of The Explorers Club. She is survived by daughter Karen Ronne Tupek, son-in-law Alan R. Tupek, grandson Michael Ronne Tupek, and granddaughter Jaclyn Jo Tupek, all of Bethesda, Maryland. Viewing with the family will be at 5 p.m. followed by a Funeral Service at 6:30 p.m. on Wednesday, June 24, at St. Dunstan''s Episcopal Church, 5450 Massachusetts Ave., Bethesda, Maryland, followed by a reception. Future interment at Arlington National Cemetery will be private. 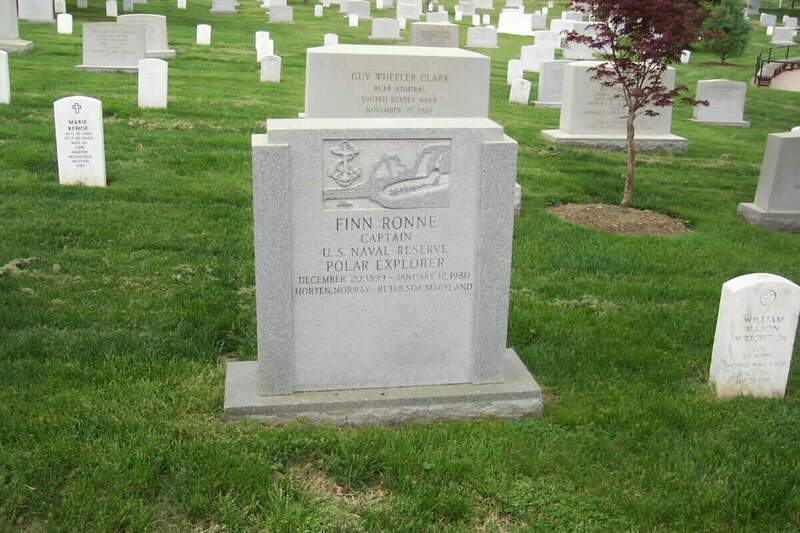 Flowers may be sent to the Tupeks at 6300 Wynkoop Blvd., Bethesda, Maryland, or in lieu of flowers, memorial contributions to The Finn and Edith Ronne Polar Exploration Award, c/o The Explorers Club, 46 East 70th Street, New York, NY 10021; or, The Edith Ronne Fellowship Fund, c/o The Society of Woman Geographers, 415 East Capitol Street SE, Washington, DC 20003. Born Edith Ann Maslin on October 13, 1919, Edith "Jackie" Ronne was raised in a conservative, private Baltimore family. Her father, Charles Jackson Maslin, worked several jobs, his last being with the B&O Railroad. Her mother, Elizabeth Parlett Maslin, could have taught school, but like a proper married woman of her day, she stayed home instead and reviewed Edith's homework every night making sure she never went to school without knowing her lessons letter perfect. According to Edith, she spent three "marvelous" summers away from home at a Girl Scout summer camp, Camp May Flather, in Virginia. It was at camp where she acquired her nickname, "Jackie." In the 1930s, Baltimore, Maryland, did not believe in co-education in their public schools so she graduated from Eastern High School at sixteen without ever having a date, except when she arranged for a classmate's brother to take her to the senior prom. Jackie spent her first two years in college at the College of Wooster in Wooster, Ohio. Then she transferred to George Washington University in Washington, D.C., In order to be near the university, Jackie moved to live with her aunt and uncle in Chevy Chase, Maryland, who were financing her education. The first person she recognized on campus was a girl from Girl Scout Camp. To her friends, she introduced Edith as Jackie, and everyone felt the name better fit her personality than Edith. Since that time she has been called Jackie. At George Washington University, Jackie joined Phi Mu Sorority, had a great social life, and in 1940 graduated with a major in History and a minor in English. When she graduated, it was not easy to find a job with a "mere" undergraduate degree. Therefore, Jackie began a typing and shorthand course while looking for work. The National Geographic Society offered her a job. After about nine months, she sought and found a government job at the Civil Service Commission paying twice the salary of the National Geographic Society. A few months later she moved on to the State Department where she would remain for over five years serving in several different positions from file clerk to International Information Specialist in the Near and Far Eastern Division of Cultural Affairs. In 1942, she met the polar explorer Lieutenant Finn Ronne (who would later advance to the rank of Commander) on a blind date and over the ensuing months, Jackie enjoyed his maturity (Finn was 20 years her senior), nationality, "charming" Norwegian accent, and stories of exploration. Finn proposed to Jackie before Christmas of 1943 and they were married on March 18, 1944. Finn Ronne was a great organizer, planner, and leader; and in 1947 he commanded the last privately funded expedition to Antarctica despite roadblocks and obstacles erected by Admiral Byrd and associates and the British who currently occupied the area of Antarctica where the Ronne Expedition was destined. (Once the Ronne Expedition reached the frozen continent, the Americans and British worked closely together.) Nevertheless, regardless of a small budget and crew, the Ronne Antarctic Research Expedition departed on January 25, 1947, from Beaumont, Texas, where Finn selected Beaumont Eagle Scout Arthur Owen to join the expedition. Jackie edited all of Finn's correspondences and reports and was to be in charge of the domestic side of the expedition. However, instead of remaining stateside, she resigned her position with the State Department to accompany her husband on his fifteen month Ronne Antarctic Research Expedition. As Expedition Recorder-Historian, Jackie Ronne wrote the news releases for the North American Newspaper Alliance. She also kept a daily history of the expedition's accomplishments, which formed the basis for her husband's book, Antarctic Conquest, published by Putnam in 1949, and made routine daily seismographic and tidal observations when the geophysicist was in the field during summer trail program. Jackie Ronne became the first American woman to set foot on the Antarctic Continent. (Before her, only the wife of a Norwegian whaling captain had done so very briefly.) Mrs. Ronne, along with the wife of one of the expedition's pilots, became the first two members of an over-wintering expedition, and the first women to spend a year in the Antarctic. No woman had ever lived in the Antarctic before this, nor did any do so for the following twenty-five years, until women scientists occasionally accompanied their scientific husbands in recent years. The 400,000-square-mile area newly discovered by the Ronne Antarctic Research Expedition was named EDITH RONNE LAND by the U.S. Board on Geographic Names, making it one of the very few land areas honoring a woman of non-royal birth. After 20 years on the maps, the feature was renamed RONNE ICE SHELF, an area which is second only to the great Ross Ice Shelf. In the years following that first expedition, Jackie Ronne has lectured extensively throughout the U.S. and in numerous foreign countries. In addition to collaborating with her husband in various scientific and popular accounts, she has written numerous articles including those for the annual editions of the Britannica, Americana, and Funk and Wagnall's encyclopedias, as well as many articles for the North American newspaper Alliance. Upon the invitation and sponsorship of the Argentine Government in 1959, she participated in the first commercial tourist cruise to Antarctica. In 1962, she made a trip to the Arctic Islands of Spitsbergen, visiting Norwegian and Russian coal mining stations on a Norwegian sealing vessel which penetrated the pack ice to within 600 miles of the North Pole. In addition, Jackie held various offices in the Society of Woman Geographers; The Columbian Women of George Washington University; the United Nations Association and the National Society of Arts and Letters. She assisted in civic organizational work in various capacities and is listed in Who's Who of American Women. Jackie received a special Congressional Medal for American Antarctic Exploration, was elected president of the Society of Woman Geographers, holding that office from April 1978-1981. She was the recipient of a special Achievement Award from Columbian College of George Washington University and dedicated a Polar Section to the National Naval Museum. She was a special Guest Lecturer aboard Abercrombie and Kent's Antarctic Cruise Ship, "Explorer," in February and March, 1995, when she returned to her former Antarctica base at Stonington Island as a guest lecturer. and aboard the Orient Lines ship, "Marco Polo," in January and February, 1996, and again in 1997, 1998, 2000, 2001, and 2002. In her lifetime, she has made 16 trips to Antarctica. Jackie Ronne has one daughter, Karen Ronne Tupek, and two grandchildren. Both her daughter and granddaughter were also Girl Scouts. Her grandson was a very active Scout and engineering student (like his grandfather Finn Ronne, who was a mechanical engineer with postgraduate studies in naval architecture) and excelled in rowing, making the U.S. Junior National Rowing Team in 2001, and anchoring the Varsity boat at the University of Wisconsin. Currently, Jackie Ronne resides in Bethesda, Maryland, and is as active and quick-witted as ever. She returned to Beaumont, Texas, on November 11, 2004, for the opening of the Ronne Expedition and Arthur Owen Museum Exhibit at the Clifton Steamboat Museum, the debut of her book "Antarctica's First Lady," a reunion of the surviving six crew members from the Ronne Antarctic Research Expedition, and the unveiling of her Adventures of the Elements character card, the Jackie Ronne card. These events to honor Jackie Ronne, the Arthur Owen family, and the expedition are being coordinated by Three Rivers Council #578, Boy Scouts of America, which is the same Boy Scout Council area that was involved in the 1947 expedition. Philanthropist, historian, and Clifton Steamboat Museum owner David Hearn, Jr., has made this historically significant event possible by funding the publication of her book and the extensive Ronne Exhibit at his museum including digitizing and preserving over 16,000 feet of motion picture film from the expedition.